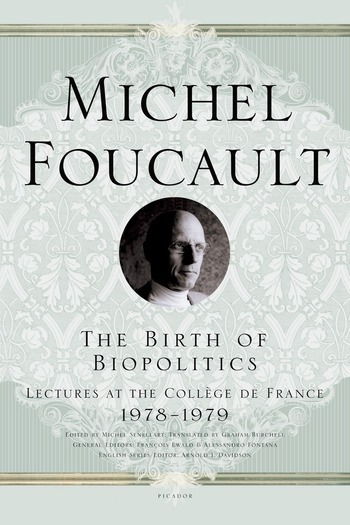 The Birth of Biopolitics continues to pursue the themes of Foucault's lectures from Security, Territory, Population. Having shown how eighteenth-century political economy marks the birth of a new governmental rationality--seeking maximum effectiveness by governing less and in accordance with the naturalness of the phenomena to be governed--Michel Foucault undertakes a detailed analysis of the forms of this liberal governmentality. In a direct and conversational tone, this book raises questions of political philosophy and social policy that are at the heart of current debates about the role and status of neo-liberalism in twentieth century politics. MICHEL FOUCAULT, acknowledged as the preeminent philosopher of France in the 1970s and 1980s, continues to have enormous impact throughout the world in many disciplines. Translated by Graham Burchell.